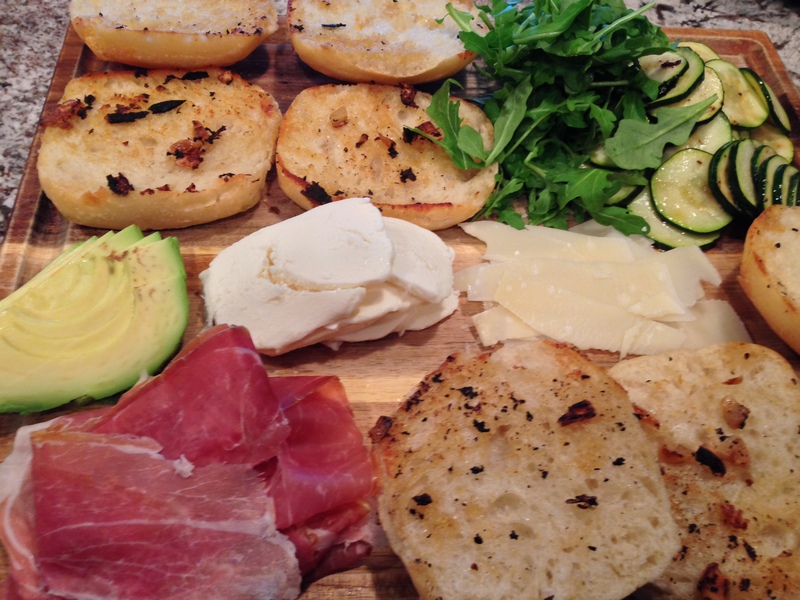 On days that I want a substantial breakfast without the carbs, a breakfast salad is my go-to. 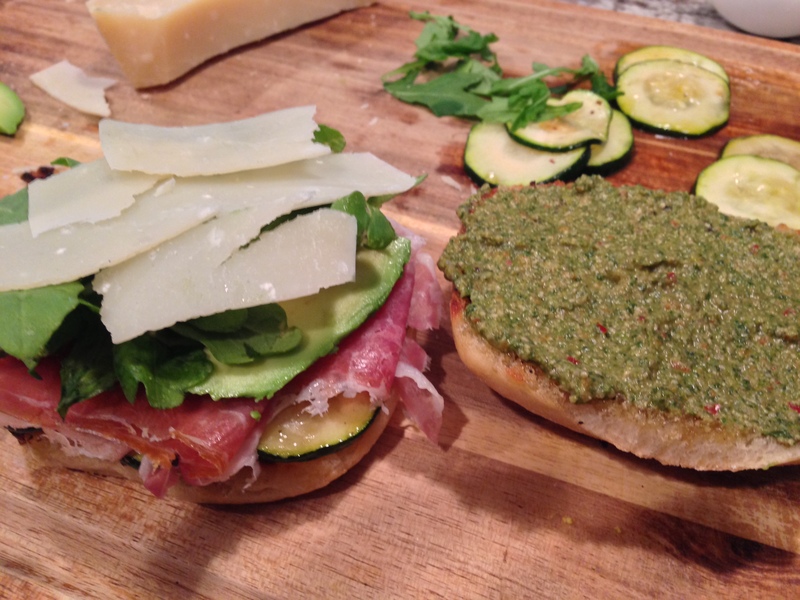 It’s easy, delicious, and filling without making you feel guilty. 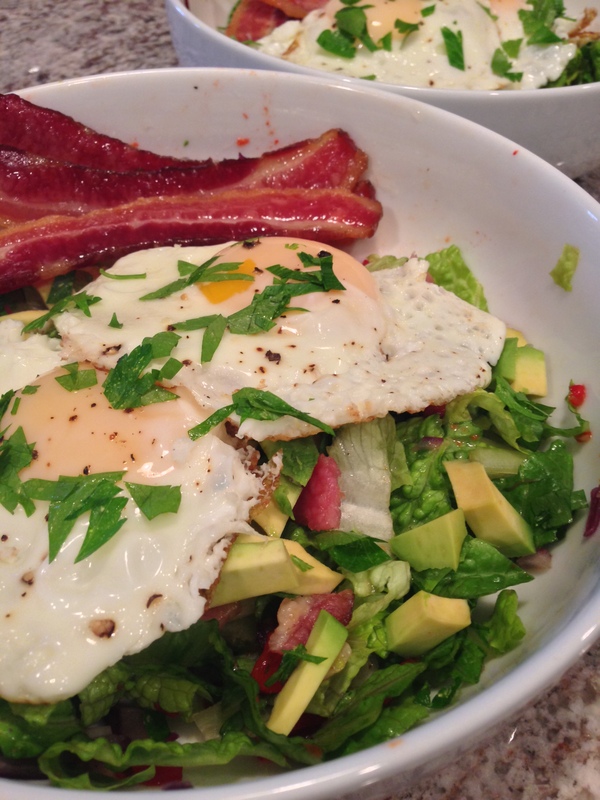 For this breakfast salad there is of course a side of bacon to go with it. 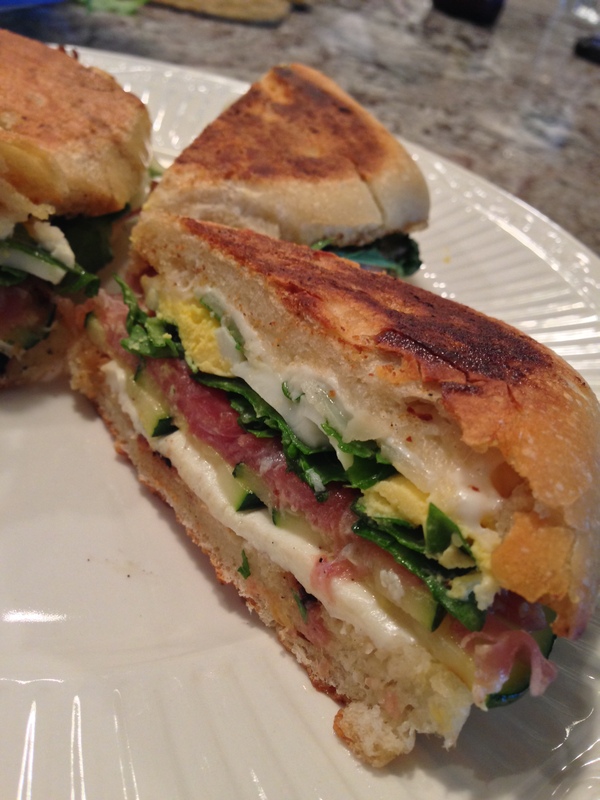 I used romaine lettuce, but you can use any greens you may have available. Add as many vegetables as you would like, this is a simple starter salad to get you going. Instead of a fat filled dressing, the roasted red peppers, lemon juice, and egg yolks combine beautifully in the bowl to do the trick. This makes 2 salads. 1. Cook bacon in the oven on a cookie sheet at 350 degrees for about 20 minutes. It will take less time if sliced thin. 2. 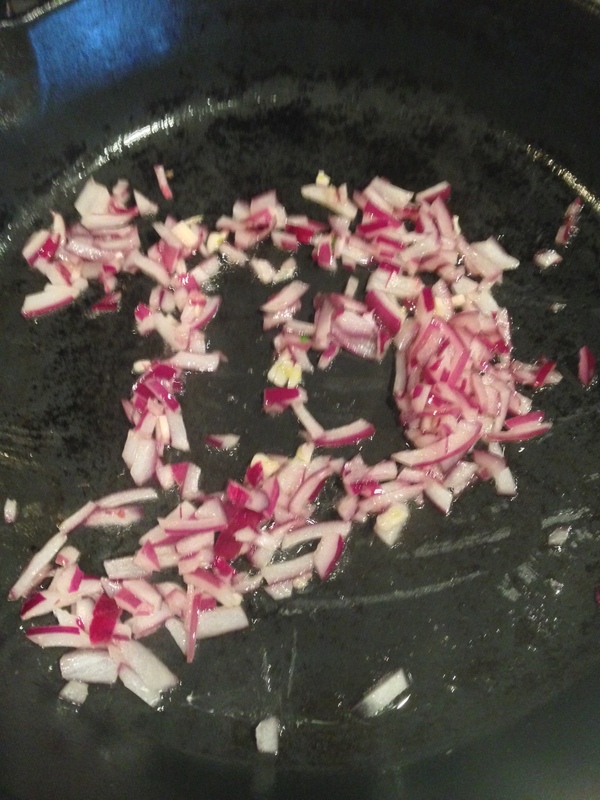 In a heavy skillet take a small amount of the bacon grease from the pan to saute onions and garlic for a few minutes. 3. In your serving bowl combine lettuce, diced red peppers and a few grinds of fresh black pepper. 4. 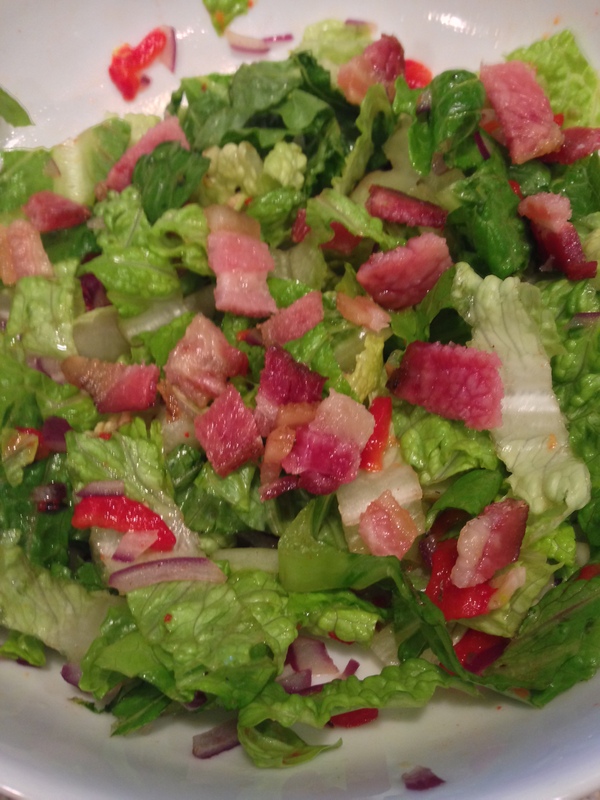 When bacon is crispy cut 2-4 slices into small pieces and add to salad with cooked red onions. 5. Cook eggs sunny-side up in skillet over medium-low heat with bacon grease to keep from sticking. 6. Top salad with avocado, eggs, cilantro, and a squirt of lemon. Breaking yolks to mix with the salad is the best dressing! This dish sounds only half as good as it actually tasted. I really enjoy lean proteins for a main course with lots of fruits/veggies on the side, but sometimes the meat will quickly dry out no matter how much care you take to avoid overcooking. Lately I have been on a serious bacon kick, even using the grease to cook vegetables…I know, perhaps I will cut back in the new year. 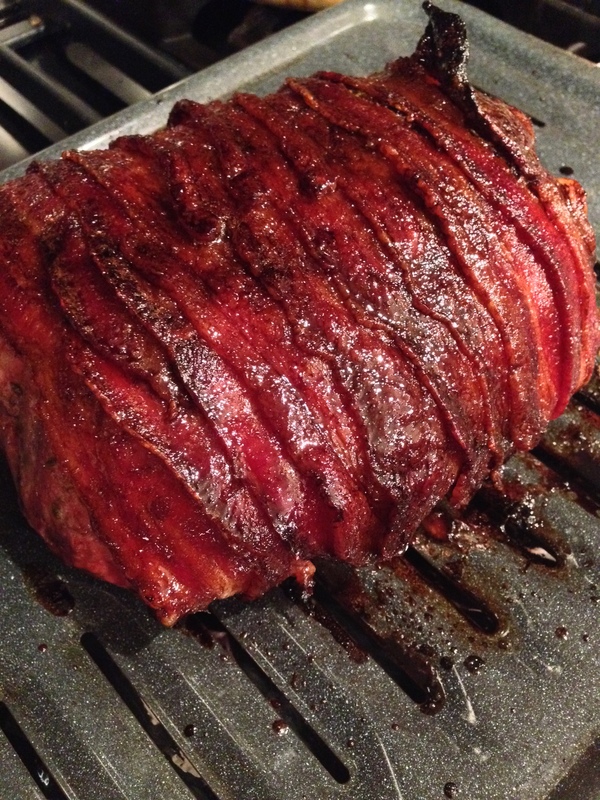 Using the bacon to keep lean meats from drying out is a great way assure a crowd pleasing moist cut of meat. With the garlic and herb rub it’s unbeatable. 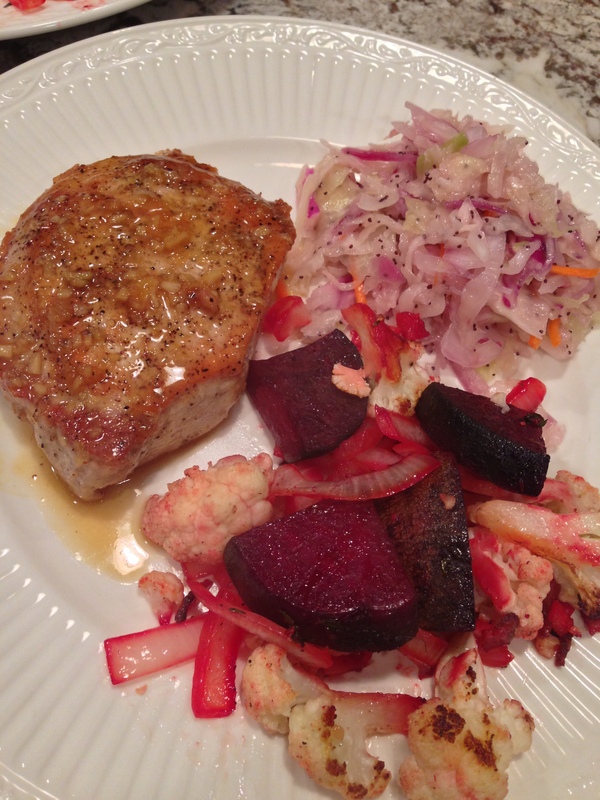 I combined recipes I found online from Fabio Viviani and Giada De Laurentiis to come up with this dish. The glazed bacon was so fantastic and crispy with the flavorful layer of garlic herbs hiding underneath. I served this with a simple salad of shaved brussel sprouts, kale, and fennel tossed with a dressing made with fresh squeezed lemon, olive oil, and shaved parmesan topped with salt and fresh cracked pepper. 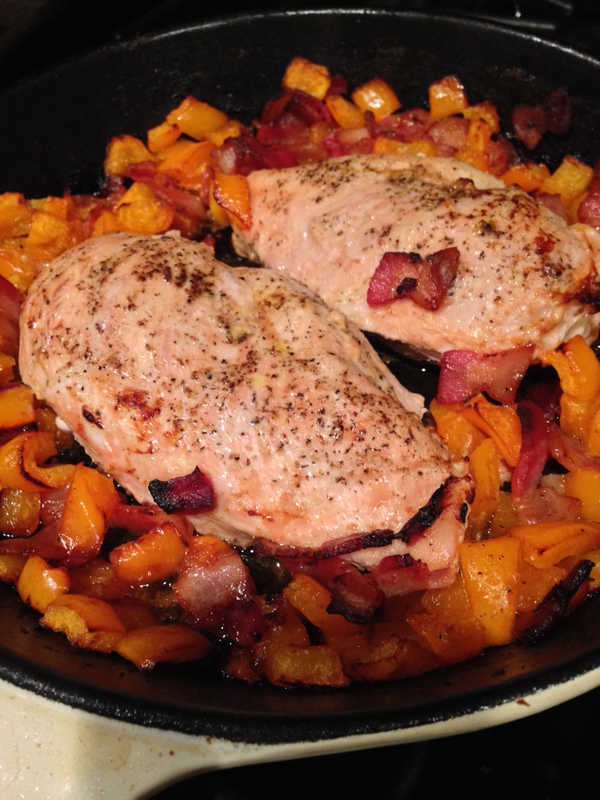 So good with a nice flavor that didn’t get lost next to the bacon and pork. 1. 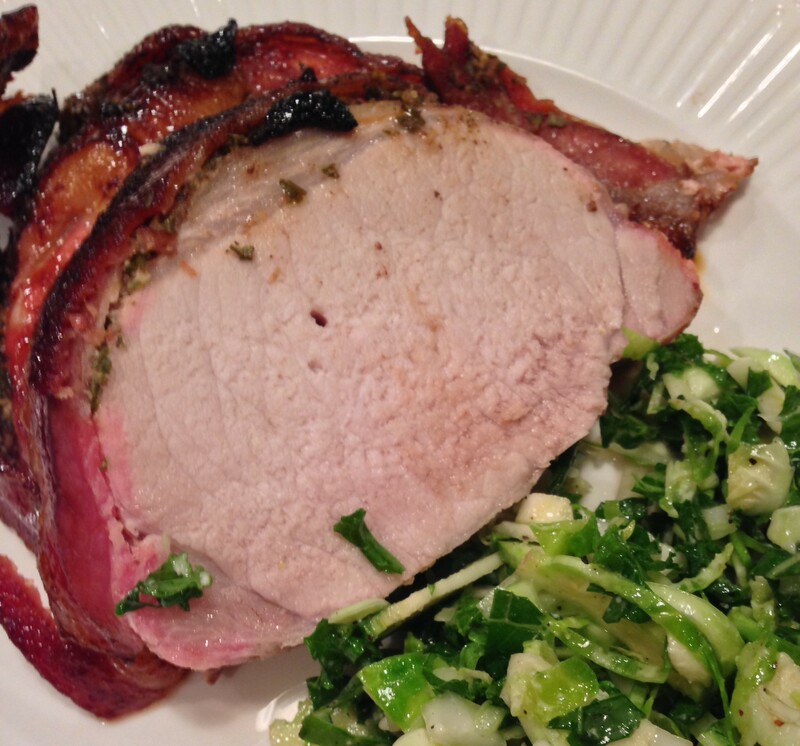 Rinse and dry the pork loin, place fatty side up on a broiler pan. I scored the shiny tendon/fat of the loin, careful not to cut into the meat. 2. Mash together the roasted garlic with the dried herbs (thyme, rosemary, oregano) to make a rub. 3. 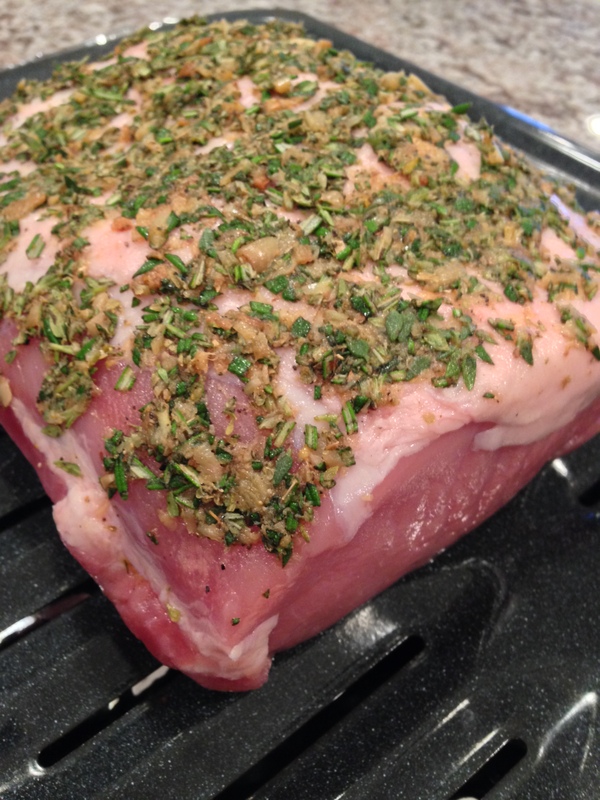 Rub the garlic herb mixture over the exposed surface of the pork loin. 4. 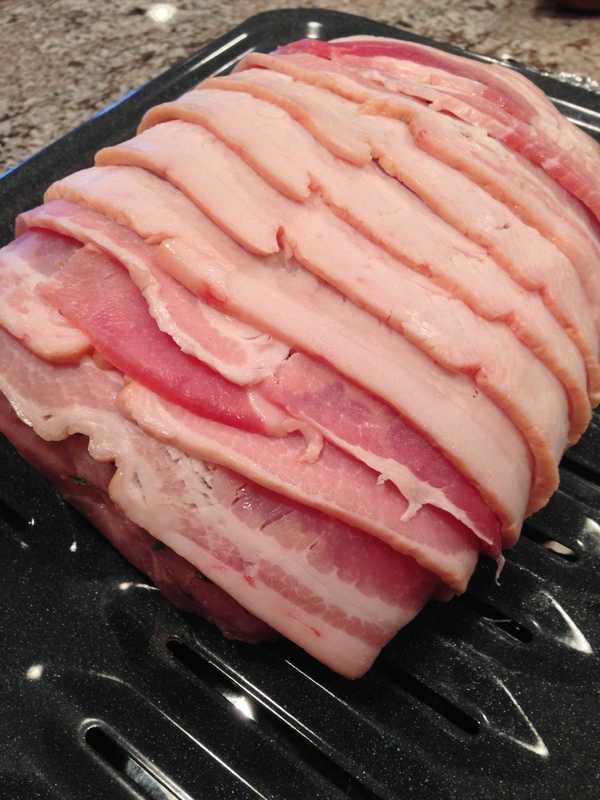 Lay the bacon slices over the loin, overlapping slightly. Tuck the ends under the loin to hold in place. If the bacon slices aren’t long enough they will curl up while cooking, so you may want to tie them down with kitchen twine. 5. Bake in the oven at 350 degrees for 1 hour. 6. Mix together the vinegar and brown sugar (adjust amounts as needed to make a thin glaze). 7. After the initial 1 hour of cooking, brush the glaze over the bacon. Return to oven to finish cooking until internal temperature reaches 145 degrees (about 30 minutes depending on the size of your loin). If you have to add a considerable amount of time to fully cook, you may want to lay foil over the bacon and/or re-glaze to avoid burning. 8. Remove and let rest for about 20 minutes. Internal temperature should rise another 15 degrees to reach 160 before serving. 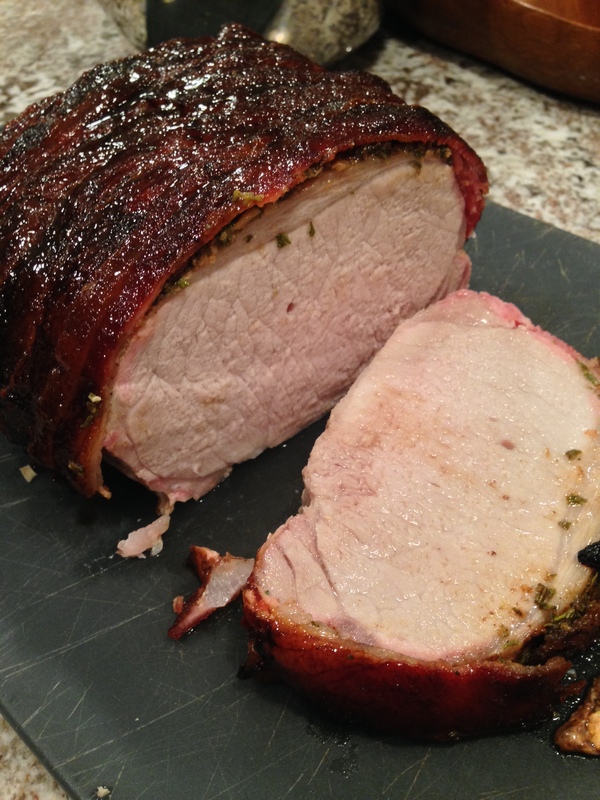 You will need to check the internal temperature of the pork with a thermometer unless you are really confident in your ability to judge cooked pork. 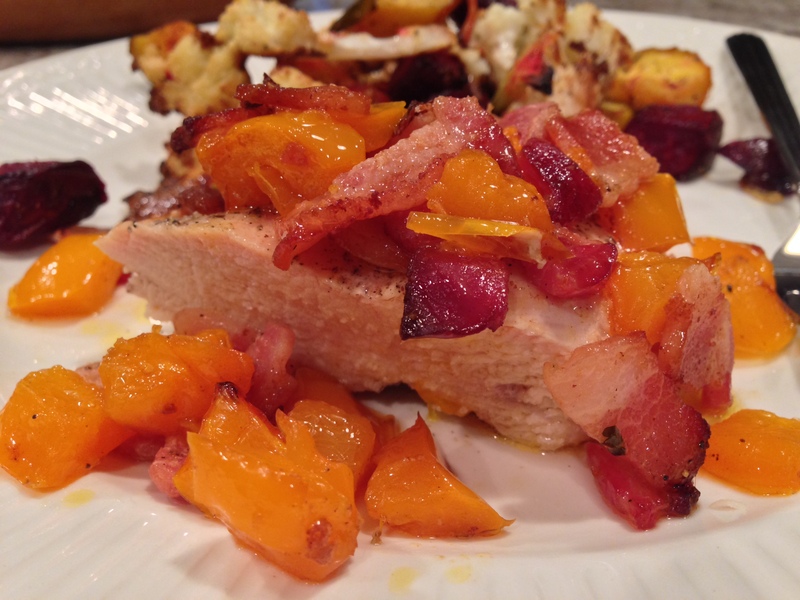 This dish is truly amazing and very easy to make. It’s true, everything is better with bacon. It’s that time of year again that roasting vegetables becomes an acceptable alternative to grilling vegetables. Roasting root vegetables is a good way to sweeten up the flavor and they look so pretty on the plate. 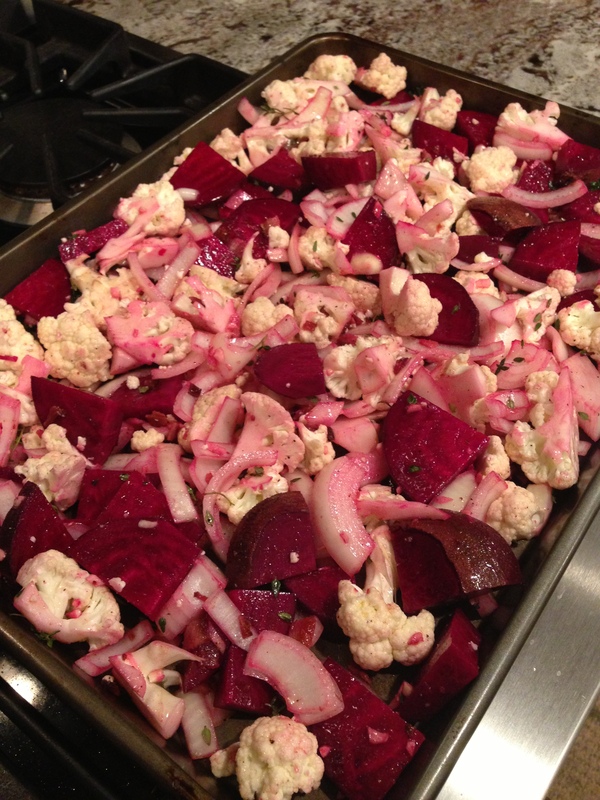 Beets and cauliflower have a nice contrasting color and when roasted they compliment each other very well. 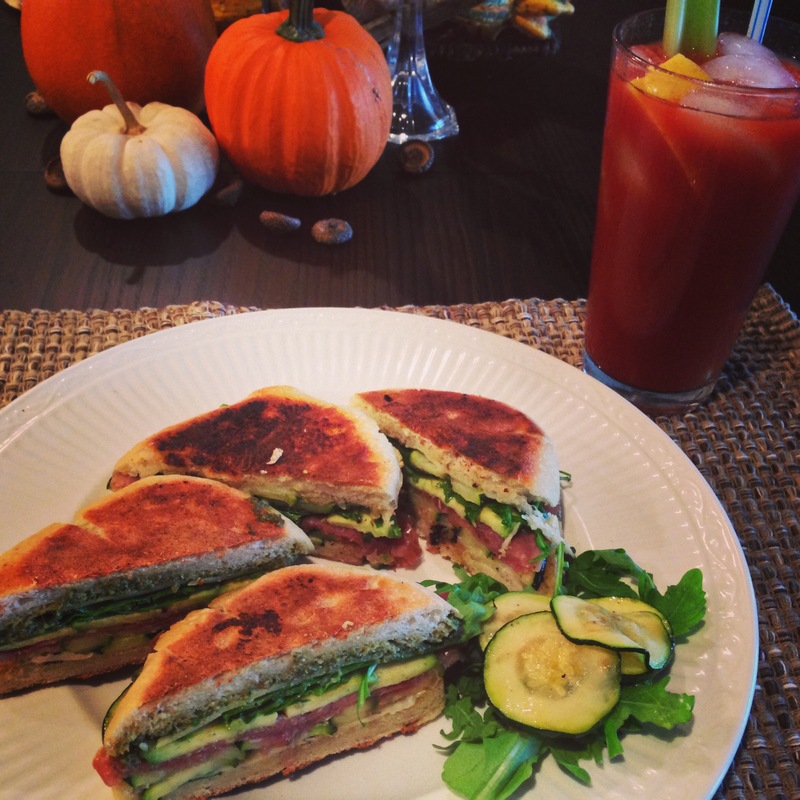 – 2-3 large beets washed and cut into small pieces. – 1/2 head of cauliflower washed and cut into small pieces. 1. 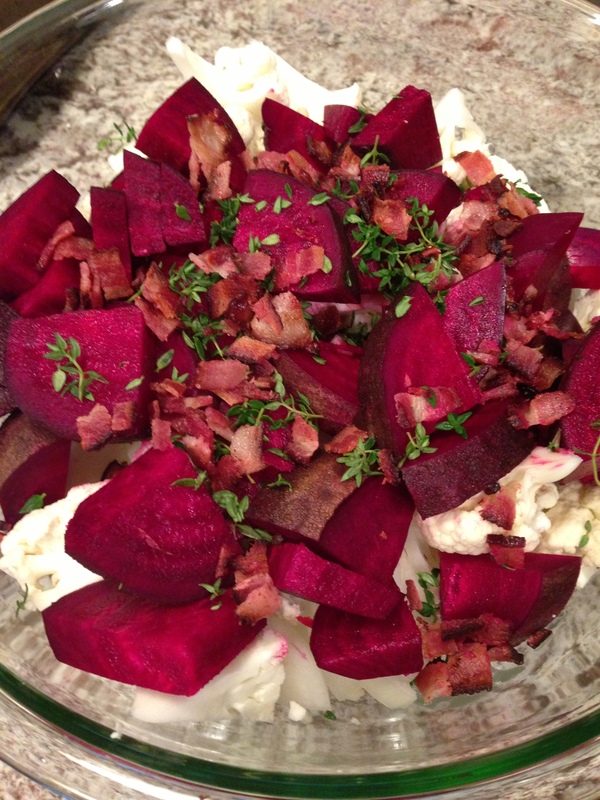 Gently mix together in a large bowl the beets, cauliflower, onion, garlic, thyme, and bacon with bacon grease and a drizzle of olive oil with salt and pepper to taste. 2. Spread the vegetables out evenly on a cookie sheet and bake at 350 for 23-30 minutes, stirring once. 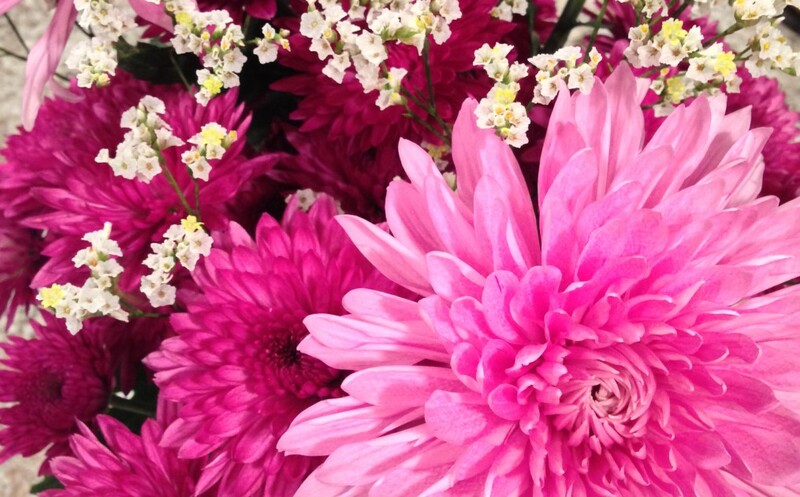 Depending on how large you cut the pieces, the time may be longer. Make sure the beets are easily pierced with a fork before serving. As the beets roast they will give off a lot of color, so be careful not to splash your clothing when flipping or serving!